The Alabama Writers Symposium celebrates its 18th anniversary in Monroeville, Alabama, Thursday, April 23—Saturday, April 25, 2015. 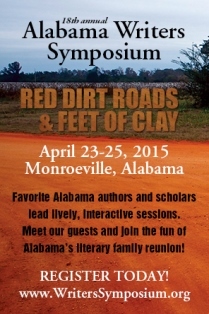 Exploring the theme Red Dirt Roads & Feet of Clay, the 2015 Alabama Writers Symposium program looks below the surface to see if things really are what they seem. 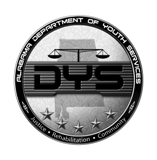 Participants should register for the event by April 3. Some of Alabama’s most celebrated writers and scholars will lead discussion sessions, readings, and workshops. Writers and scholars participating in the event include Rick Bragg, Rob Gray, Rod Davis, Frye Gaillard, Chantel Acevedo, Ravi Howard, Jason McCall, Jennifer Horne, Kirk Curnutt, Anita Miller Garner, Valerie Boyd, Don Noble, Philip Shirley, Deidra Suwanee, Caroline White, Lisa Graves Minor, Steven Trout, Nancy Anderson, Jacqueline Trimble, Jeanie Thompson, Marlin Barton, Cynthia Tucker Haynes, songwriter Davis Raines, and featured artist Virginia Shirley. Registration forms are available at WritersSymposium.org. Tickets are limited for the Thursday evening Opening Reception with Rick Bragg, the Friday Awards Luncheon, the Saturday brunch, and the live performance of To Kill a Mockingbird. Admission to discussion sessions is free. On Thursday, April 23 participants can enjoy an opening reception with Rick Bragg. Friday’s events include readings by Rod Davis, Frye Gaillard, Jason McCall, Jennifer Horne, Kirk Curnutt, and Anita Miller Garner and a musical performance by Davis Raines. Rob Gray will also present his documentary Mobile in Black and White, and the Poarch Band of Creek Indians will present a panel on Writing Our Own History. Also on Friday, participants may attend a picnic on the Old Courthouse Museum lawn and the popular community theatre production of To Kill a Mockingbird. Saturday morning’s schedule in the old courthouse of the Monroe County Museum includes readings by Chantel Acevedo, Ravi Howard, and Hank Lazer. Don Noble, Jennifer Horne, and Southern Exposé will present Truman Capote’s “House of Flowers.” The concluding brunch with Philip Shirley will be held at the Monroeville Community House. In 1997, the Alabama legislature designated Monroeville and Monroe County as the Literary Capital of Alabama in recognition of the region’s remarkable literary heritage. Among the writers who at one time or another have called Monroeville and Monroe County home are Truman Capote, author of such classics as In Cold Blood and Breakfast at Tiffany’s; Harper Lee, author of the Pulitzer Prize-winning novel To Kill a Mockingbird; Mark Childress, author of seven novels including the bestselling Crazy in Alabama; and Atlanta Journal-Constitution editorial page editor Cynthia Tucker Haynes. 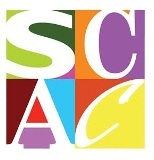 The symposium is a project of the Alabama Center for Literary Arts and is sponsored by Alabama Southern Community College. Symposium supporters include George Landegger, Alabama Humanities Foundation, Alabama State Council on the Arts, and The City of Monroeville. The symposium is produced in cooperation with the Alabama Writers’ Forum, the Association of College English Teachers of Alabama, Monroe County Museum, and the Monroeville/Monroe County Area Chamber of Commerce. Visit The Alabama Writers Symposium website for schedule updates, registration forms, and hotel accommodations. For more information, phone Donna Reed at 251-575-8223 or e-mail dreed@ascc.edu.